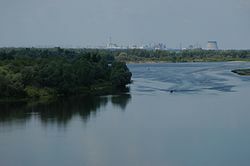 The Pripyat River or Prypiat River (Ukrainian: Прип’ять Prypyat′, pronounced [ˈprɪpjɑtʲ]; Belarusian: Прыпяць Prypiać, [ˈprɨpʲat͡sʲ]; Polish: Prypeć, [ˈprɨpɛtɕ]; Russian: Припять Pripyat′, [ˈprʲipʲɪtʲ]) is a river in Eastern Europe, approximately 761 km (473 mi) long. It flows east through Ukraine, Belarus, and Ukraine again, draining into the Dnieper. The Pripyat passes through the exclusion zone established around the site of the Chernobyl nuclear disaster. The city of Prypiat, Ukraine (population 45,000) was completely evacuated after the Chernobyl disaster. Pripyat has a catchment area of 121,000 km2 (47,000 sq mi), 50,900 km2 (19,700 sq mi) of which are in Belarus. 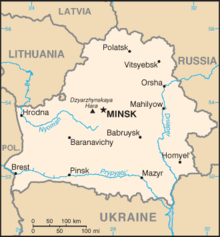 495 km (308 mi) of the whole river length lies within Belarus. Pripyat begins on the Volyn Hill, between the villages of Budnik and Horn Smolars of Lyubomlsky District. After 204 km downstream, it crosses the border of Belarus, where it flies 500 km along the lowland of the Poles in a weakly valued valley; in the area of Pinsky bogs flows in low boggy shores, split into sleeves, in the middle of the course sandy banks, the bank is unstable, in the lower one - in the course of increasing the number of rolls. The last 50 kilometers Pripyat flows again in Ukraine and flows several kilometers south of Chernobyl into the Kiev reservoir. Max Vasmer in his etymological dictionary notes that the historical name of the river mentioned in the earliest East Slavic document, Primary Chronicle is Pripet (Припеть) and cites the opinion of other linguists that the name meant "tributary", comparing with Greek and Latin roots. He also rejects some opinions which were improperly based on the stem -пять, rather than original -петь. It might also derive from the local word pripech used for a river with sandy banks. (in Belorussian, Russian and English) T.A.Khvagina (2005) POLESYE from the Bug to the Ubort, Minsk Vysheysha shkola, ISBN 985-06-1153-7. ^ a b "Main Geographic Characteristics of the Republic of Belarus. Main characteristics of the largest rivers of Belarus". Land of Ancestors. Data of the Ministry of Natural Resources and Environmental Protection of the Republic of Belarus. 2011. Retrieved 27 September 2013. ^ Room, Adrian (1997). Placenames of the World. Jefferson, North Carolina: McFarland. This page was last edited on 25 November 2018, at 23:30 (UTC).